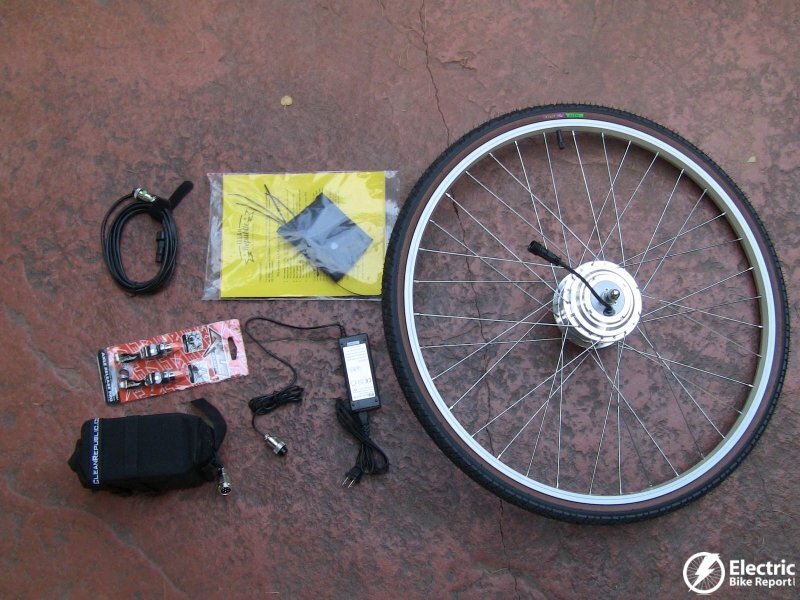 The Clean Republic Hill Topper electric bike kit has been on my list of kits to review because it is a simple and economical way to turn a conventional bike into an e-bike. In this post I will cover the specs of the kit along with my experience with the installation. There are a few videos and a bunch of pictures documenting the installation. After you checkout the specifications and installation below, make sure you checkout the full review of the Hill Topper with information on what the ride is like, real world speed & range, pros, cons, and who this kit is for. Range: Please see battery options below. 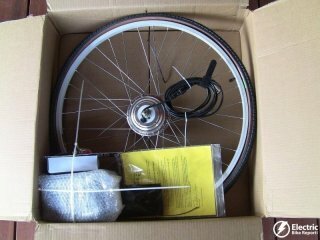 Spokes: Two cross lacing pattern, steel 13 gauge (2.3mm) spokes. -10 mile sealed lead-acid (SLA), 24v 8Ah weighs 11 lb., 4 hour recharge rate, 400 cycle life. -10 mile lithium ion, 24V 4.4Ah weighs 2.3 lb., dimensions = 2.5″ x 3″ x 8″, 500 cycle life. Throttle: On/off switch with velcro strap attachment to handlebars. Warranty: Standard 1-year warranty on ALL parts. “If you have any quality issue with any electric bike kit component we’ll replace it at no extra charge.” Additional 2 year warranty coverage available. -$399 for 10 mile standard sealed lead acid battery option + shipping. -$499 for 10 mile Sprinter lithium ion battery option+ shipping. -$795 for 20 mile lithium ion battery option+ shipping. -$1295 for 40 mile lithium ion battery option+ shipping. -There is also the option of the “Pro Pack” which is the Hill Topper without the complete wheel. These Pro Packs are generally $100 less than the Hill Topper kit. They are intended for bike shops or DIYers who want to build the motor into their own wheel. The kit I tested came with the Axle Release quick release option. Clean Republic has a very detailed frequently asked questions page. They have answers to almost any possible question! IMPORTANT NOTE: You need to check with Clean Republic to make sure the fork on your bike will work with their kit. Here is a link to the FAQ page where you can find more info on this. Overall the installation experience was pretty smooth. I had to move a spacer from one side of the hub to the other to get the motor to fit in the fork. If you have a similar situation make sure you contact Clean Republic for the proper way to do this. 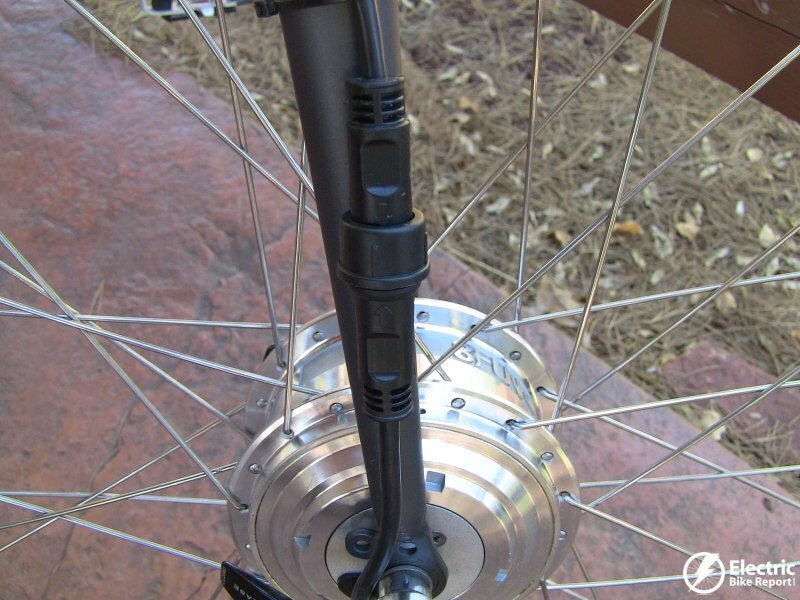 There is a motor wire connector that makes it very easy to install or remove the wheel from the bike. Included in the Hill Topper kit was the Axle Release levers. 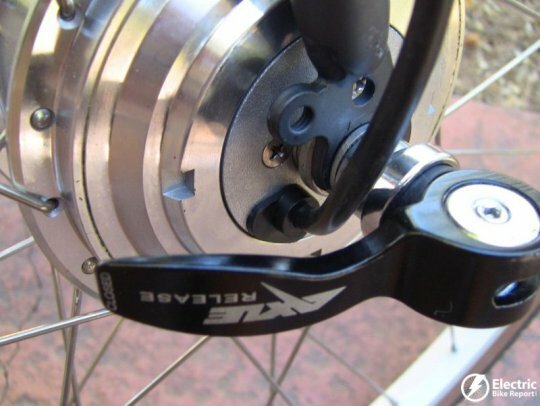 These are quick release levers that can be added to a traditional threaded axle. 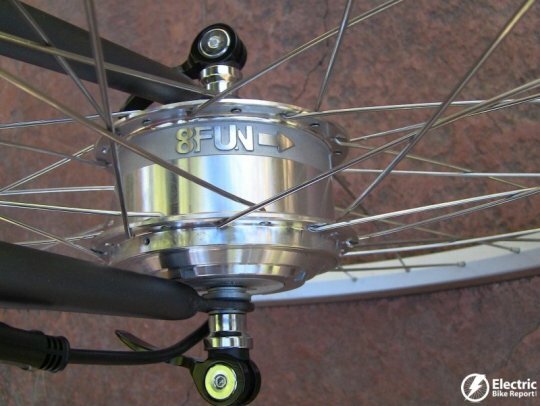 They replace the typical axle nuts and allow you to remove the wheel without tools. 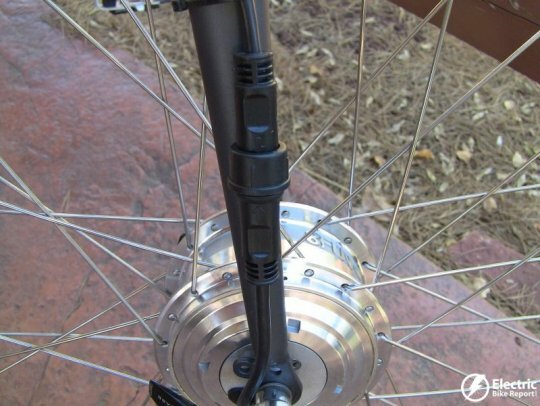 They work well on the Hill Topper kit because the motor wire comes out of the side of the hub, not through the end of the axle (some hub motors are that way). They installed easily on the Hill Topper and they worked well to secure the wheel and release it quickly. 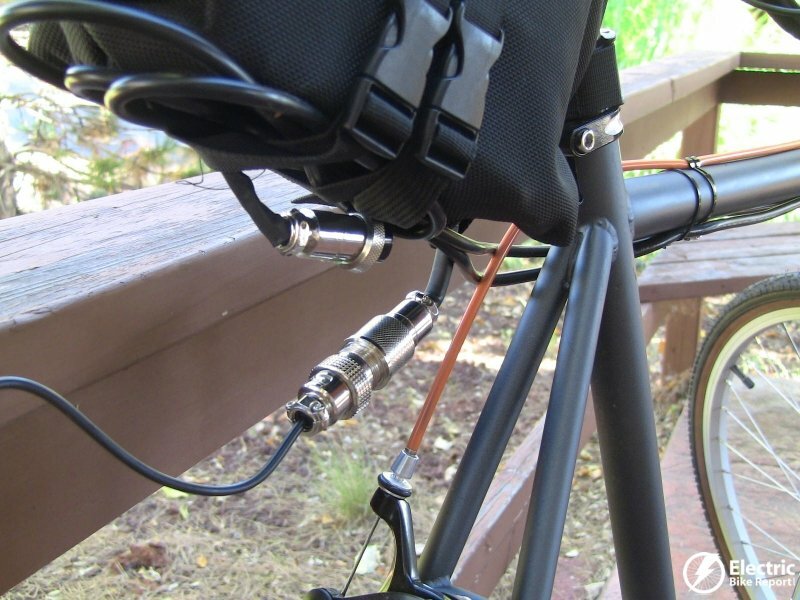 The kit is controlled by a simple on/off switch that is attached with a velcro strap to the handlebar grip. 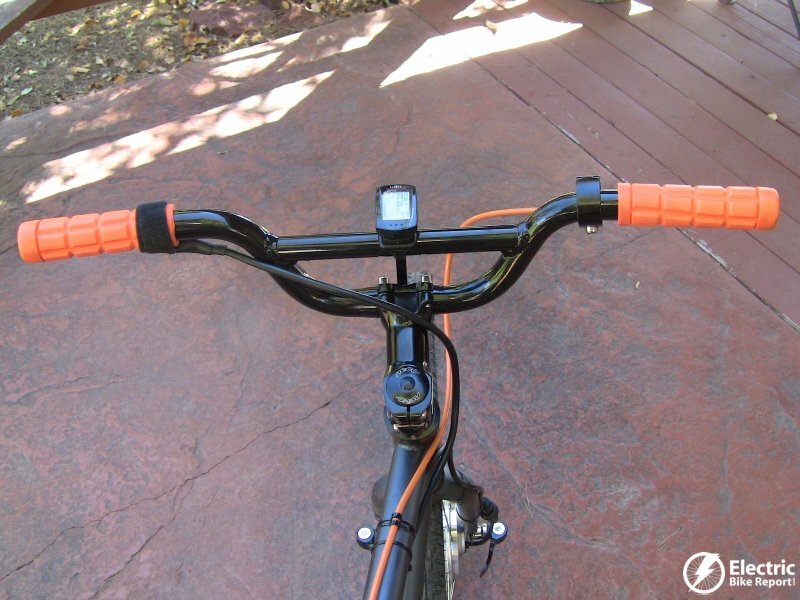 I positioned the on/off button under the grip so that I could use my index finger to turn the kit on while still maintaining a secure grip on the handlebars. When charging the lead acid battery pack you need to make sure that the on/off switch on the battery is in the “on” position. In case you don’t know the “I” is on and the “O” is off. 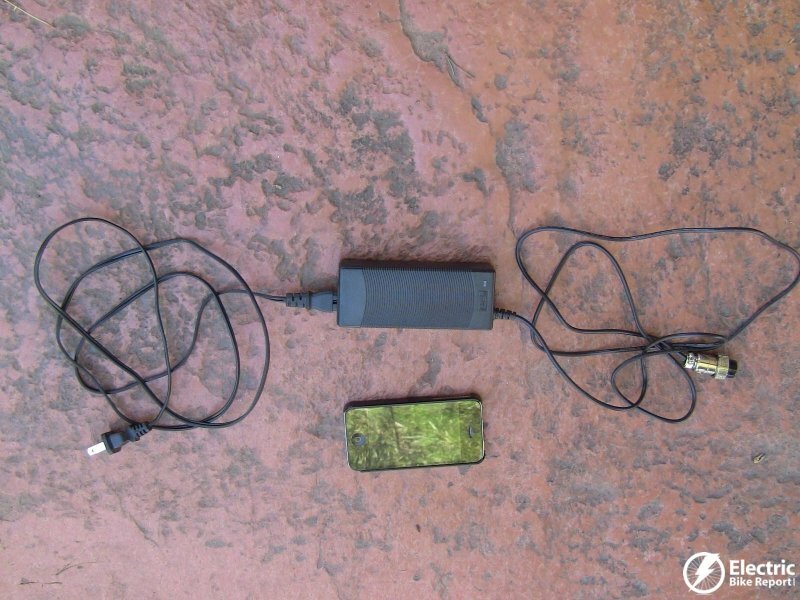 Plugging in the charger requires that you disconnect the battery from the bike wiring and plug in the charger. 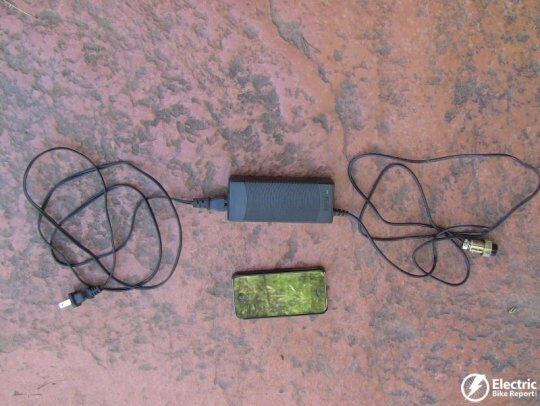 The charger is pretty small and light! 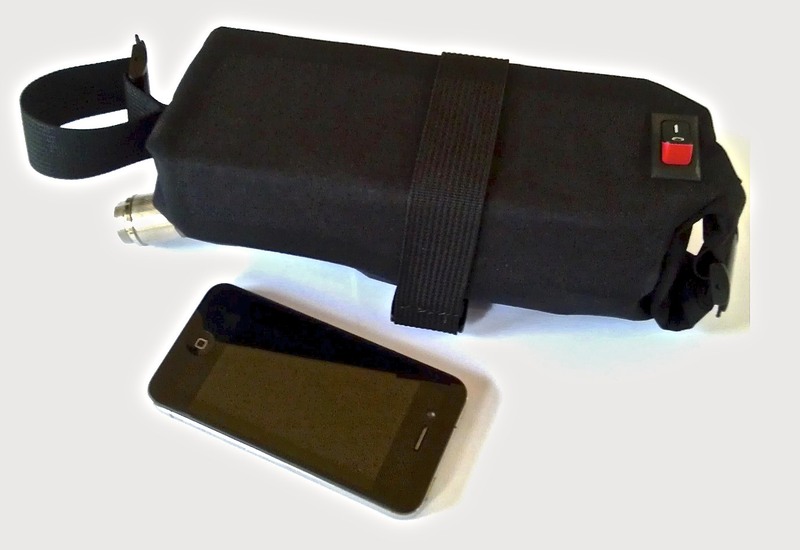 You can easily take it with you for charging on the go. Here is a link to Clean Republic for more info on the Hill Topper. 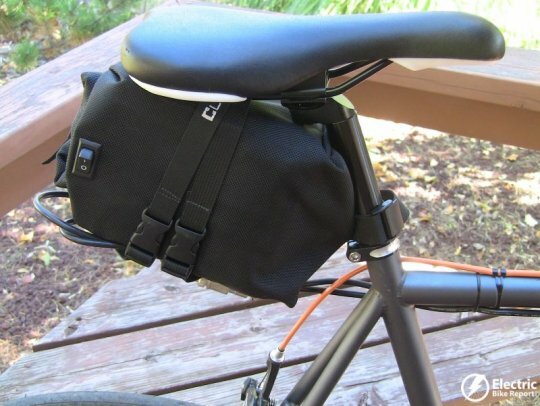 Now, checkout the full review of the Clean Republic Hill Topper electric bike kit! Great write up, Pete. Very thorough. Looking forward to the review of the ride. Thanks Ted! The review will be posted soon. I am glad you are also a promoter of ebikes! We need to get the word out about these great electric vehicles. Thanks for your site and your great articles. Ordered 20k Hill Topper. Looking forward to getting it.